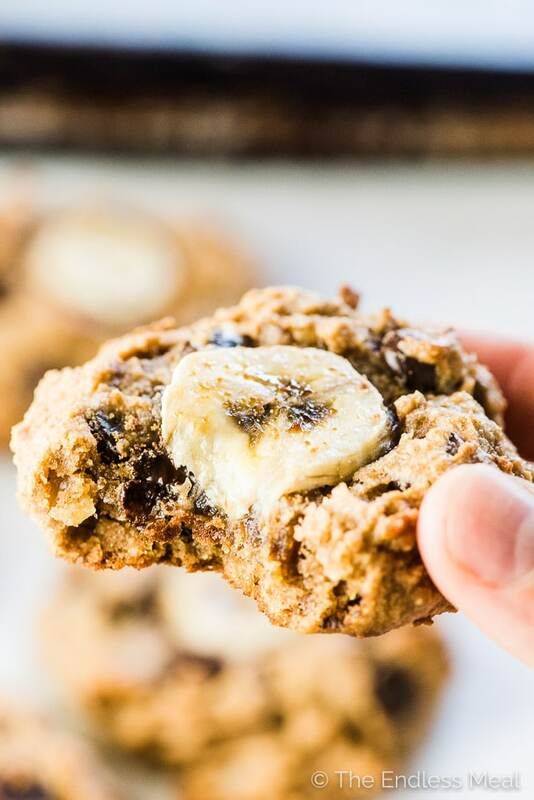 Chunky Money Paleo Banana Cookies are chewy and flavorful healthy cookies that are completely grain-free. They taste like dessert but are full of good for you ingredients making them perfect for busy weekday mornings. 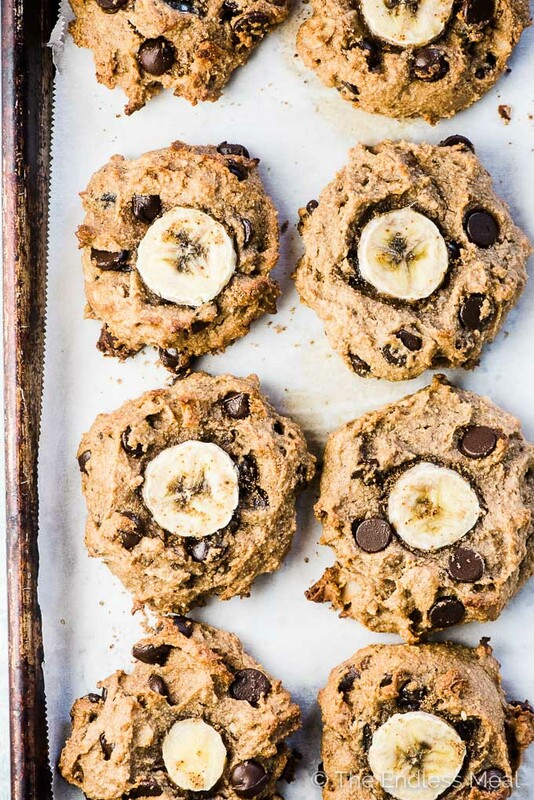 Fact: chunky monkey paleo banana cookies for breakfast = awesome. They are breakfast staples like bananas, walnuts, and almonds disguised as cookies. They last for several days so you can make a batch on Sunday and grab a couple on your way out the door on Monday, Tuesday, and Wednesday. Read: cookies for breakfast all week long! 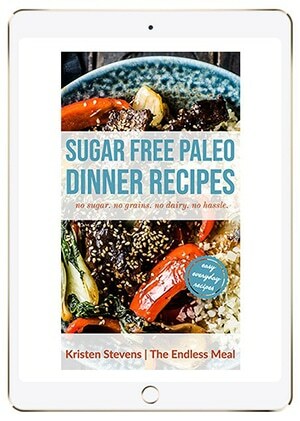 This is a super easy paleo cookies recipe. 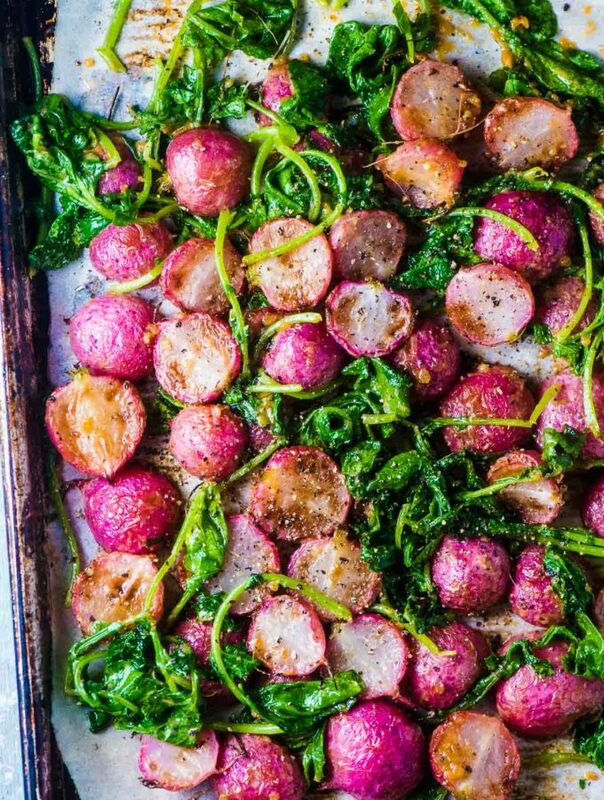 Throw everything into one bowl, mix, bake, and eat. CHOCOLATE. Did I mention that these are banana chocolate chip cookies? Chocolate makes everything better. They are tender and chewy and totally paleo cookie delicious. They are also made without dairy or eggs so they're 100% vegan breakfast cookie certified. 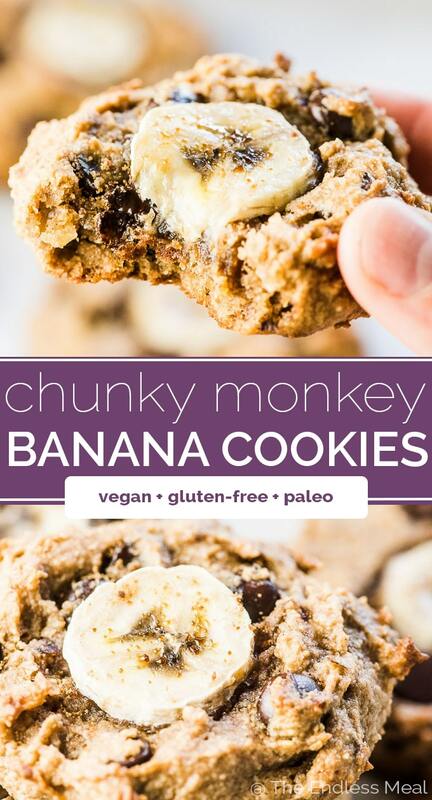 What the heck are chunky monkey banana cookies? 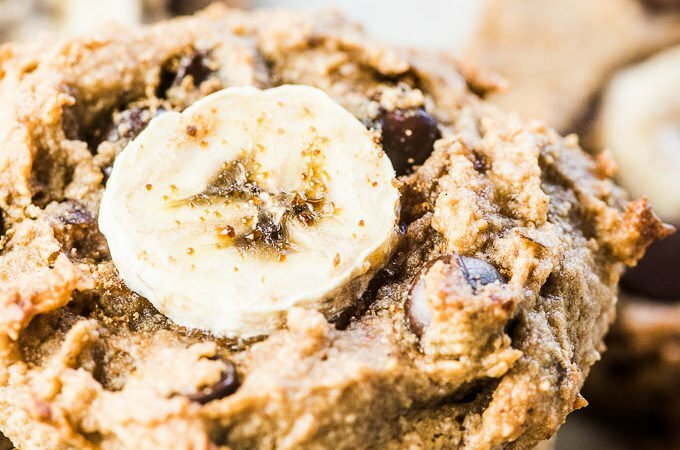 → Made from a base of bananas and almond flour. My rationalization for naming these Chunky Monkey Cookies: Monkeys like bananas. There are bananas in these cookies. That's a good enough reason, right? → Loaded with chocolate chips. Yes! 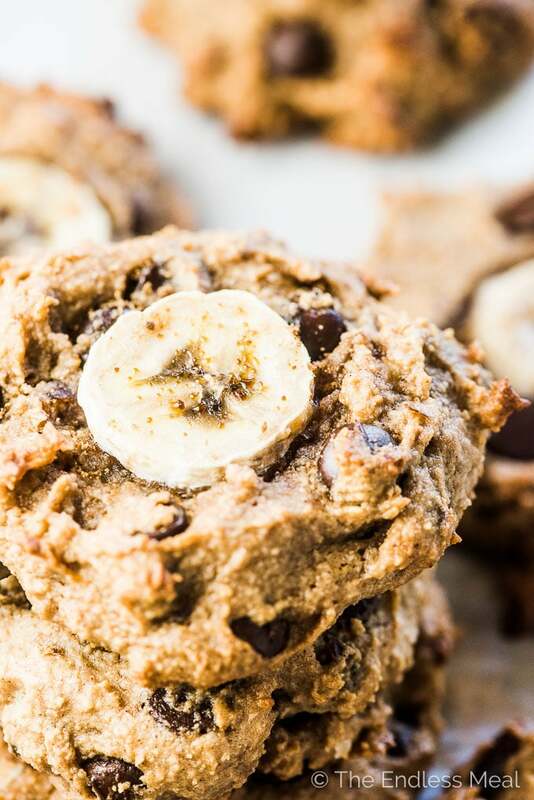 What do paleo banana cookies taste like? Paleo cookies are not your average cookie. There is no butter, flour, or sugar in sight. All paleo cookies (at least the ones that I've tried) tend to be more dense and chewy. 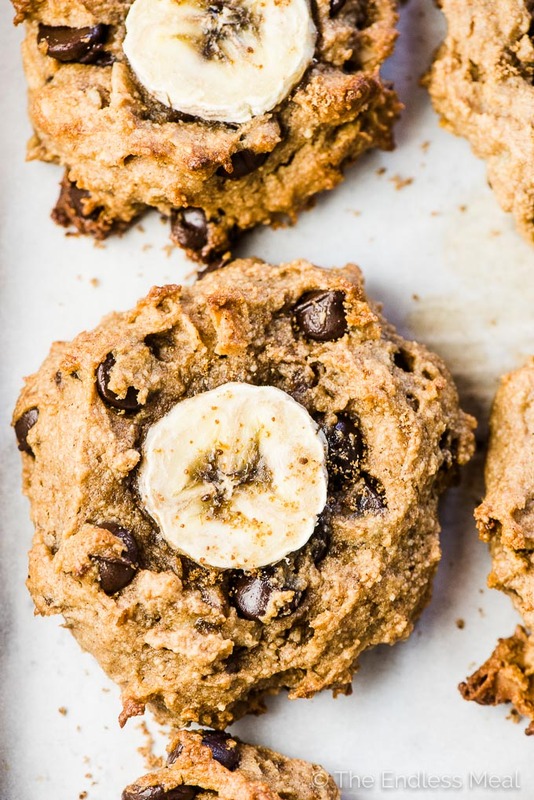 If you're going to compare paleo cookies to regular cookies, then these paleo banana cookies are similar to a healthy breakfast cookie, with a slightly different texture. The almond flour makes them a little chewier than a regular cookie … which is not a bad thing. They are the perfect morning cookie! Add the banana slices, almond butter, water, and vanilla to a large bowl and beat with electric beaters until mostly smooth. Add the almond flour, baking powder, cinnamon, and salt and beat until combined. Fold in the chocolate chips, walnuts, coconut, and raisins. Drop the dough (it will be sticky) into 12 equal mounds on the baking sheets. Press a banana slice into the top of each cookie to flatten it out a little. Bake for 16-18 minutes, or until the bottoms are golden then remove the cookies from the oven and let them cool. I haven’t tried them with anything but almond flour. Are you allergic to all nuts? I’m sure another nut flour would work – although you might have to grind your own as I don’t know of any others that are readily available in stores. I know these are vegan cookies but do you think the recipe would work well if used all-purpose flour + whole milk or all-purpose flour + almond/soy milk? Do you think those combos would work? Really want to try out the recipe! I definitely think that the water could be replaced by dairy or almond/ soy milk. I’m not sure about the flour. All-purpose flour and almond flour are very different so the recipe might take some tweaking to get it to work properly with regular flour. Do you have the nutritional fats? Just added them for you! 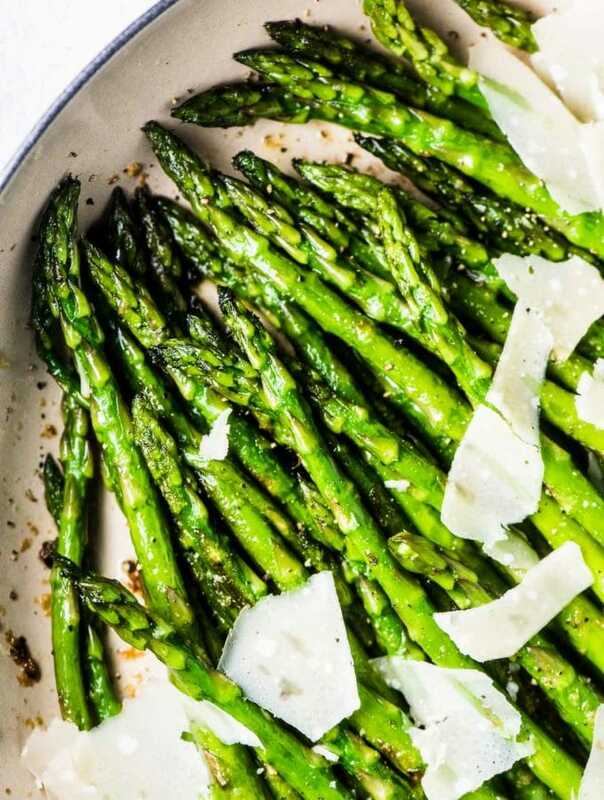 I love the recipes ease and how great they taste. If I wanted to add some protein or fiber powder, how would I best offset that with a liquid? I would add a little more water. Add the protein powder first then add water only as needed. Since you’ve made these before you’ll have a pretty good idea of what the batter should be like. I think it should work just fine! I think almonds would work just fine! I know you mentioned you hadn’t used anything but Almond flour. What are your thoughts on using Oat flour? I thought I had almond flour but only have about 1/3 cup. Do you think I could substitute coconut flour? Coconut flour is quite different and (to be honest) I haven’t had much luck with it. It requires a lot more liquid that almond flour so I would worry these would end up very dry if you used it. If you have a high-powered blender you could always use it to grind some almonds into almond flour! What can I use in place of the coconut? Or can I omit it all together? Can you use pecans in place of walnuts? Would all-purpose flour work in a pinch? I’ve honestly never tried it so I can’t say for sure. It’s worth experimenting! Can these be frozen and for how long? I want to food prep for upcoming baby! And congrats on your upcoming little one! These are so good! Just made them. What’s the best way to store them? Fridge? I generally store them in a plastic bag on the counter. I’m sure the fridge would work just fine, too! I would love to try them! So on Instagram, did you substitute both chocolate chips and raisins for currants? Nope! But you could use currants instead of raisins. That would be good, too! Trying not to eat the whole batch! I love your site…I may cook everything. I would definitely try them. They sound delicious.